For Sale, minimum price $3,850, includes original case. Buyer responsible for shipping and insurance or arrange pickup in SoCal. Takamine introduces the EF75S OM style guitar made with an AAA Sitka Spruce top with solid Brazilian Rosewood back and sides. This new and very limited model is another example of the superb art and craft of guitar making for which Takamine is well known for. This collector level guitar is also stage and studio ready, as it is equipped with a new electronic system that matches the Takamine Palathetic pickup with an on-board class A G line driver mounted discreetly to the heel block inside the guitar. “We chose to power our exotic tonewood models without cutting the preamp mounting port in the side by using our new line driver mounted internally for fully active output,” explained Mike Markure, Takamine product manager. So, What the heck is a Takamine EF75 guitar? From the French Guitarist Magazine by Jerome to Witko. 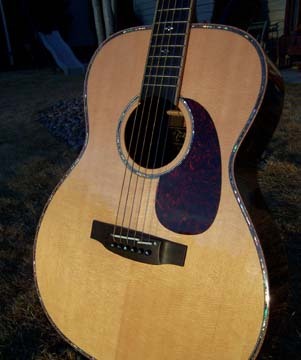 In 2005 Takamine set out to build a very special limited edition guitar. The company had been sitting on a stock of coveted Brazilian rosewood, sufficient quantity for the back and sides of about 100 guitars. Sorting the wood and discarding those that did not meet stringent standards for tonewood, the yield was about 85 sets. The decision was made to design the guitar as an OM size. Overall dimensions are very similar to OM models from other makers. 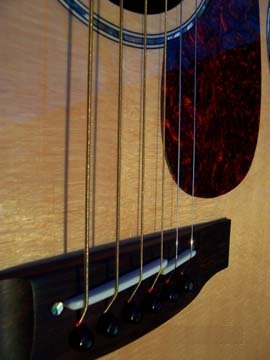 The nutwidth would be a wide 1-3/4 inch to appeal to fingerpickers as well as strummers. And the guitar would have sufficient cosmetic treatment, such as inlaid abalone and maple trim, to compliment the rare Brazilian wood. The EF75 was built in the Takamine factory located in Sakashita, Japan. A point of clarification regarding the model number. You may see this guitar listed as either EF75J or EF75S. There is no difference. The J and S are different designations between Takamine and it's U.S. distributor, Kaman Music Corp. The heart of any guitar is the soundboard. 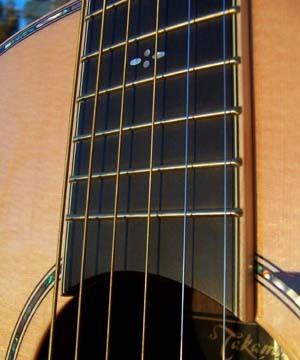 As one of the worlds largest manufacturers of acoustic guitars, Takamine has an extensive inventory of select tonewoods. From its very conception the EF75 was targeted to be a very special and elite instrument, hence only the finest AAA grade spruce tops were chosen. 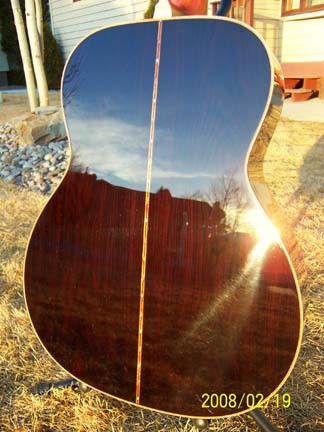 The 15+ year old stock of rare Brazilian Rosewood was perfectly sized for OM body back and sides. Joined together with figured maple binding and the soundboard trimmed in detailed abalone. Bracing is a scalloped X design. The neck is choice mahogany, supporting an ebony fretboard bound in maple with mother Of pearl and abalone inlays. The beautiful headstock is also faced in Brazilian rosewood and trimmed in figured maple with a Takamine logo inlay of Koa. Tuning is handled by vintage style Gotoh open gear tuners. 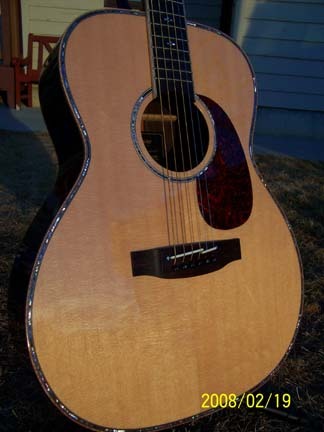 Visually, the EF75 appears to be an acoustic-only guitar. But deep inside is a Class A-G line driver preamp coupled to the undersaddle pickup and feeding out through the end pin jack. The plugged in tone rivals anything you can buy. Excellence in simplicity. But acoustically is where this guitar really shines. Bright and crisp, but with wonderful mellow woody overtones. To say it rivals other Brazilian Rosewood guitars costing three times as much is almost an insult. In so many ways the EF75 is in a class by itself. If you are an owner of an EF75, consider yourself lucky. These rare guitars will certainly turn into highly coveted collectors instruments. 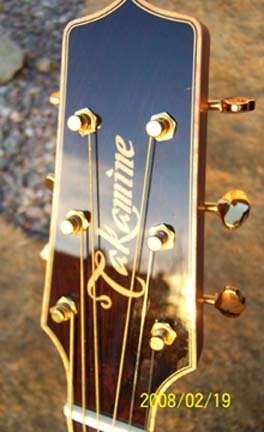 See www.takaminegallery.com for pictures of #77. Width at lower bout	15 - 3/8 "
Width at upper bout	11 "
Width at waist	9 - 3/8 "
Body length	19 - 5/8 "
Body depth at neck	3 - 5/8 "
Body depth at endpin	4 - 1/4 "
Phantom, fast and low...never slow! Al ... I'll make you a deal. I'll trade you my EF75 for 200 pounds of your inventory, buy I get to pick the 200 pounds. Deal? Guitars, misc parts, audio gear, LP's ... everything is fair game. I'll let you keep the car parts and the furniture.